I’m back in Athens after a vacation on the beautiful island of Kythera here in Greece (you can check some of the yummy things I ate on instagram). 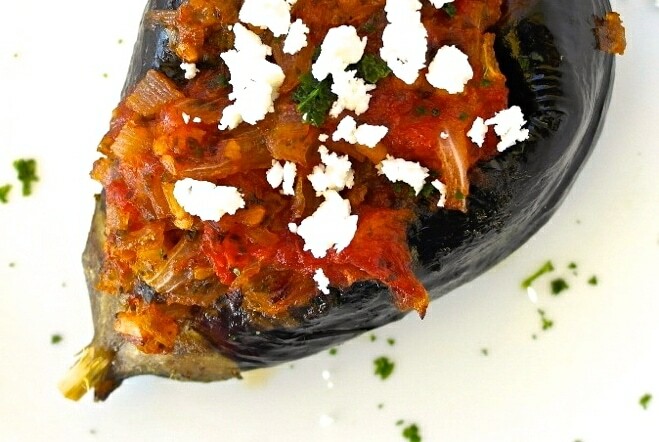 Now Kythera is known for its eggplant, and although I was able to eat plenty of melitzanosalata (eggplant dip), it seemed that whenever I wanted to order stuffed eggplant-known as melitzanes imam, they had always run out. So, back at home I made it. Now, this dish is known to be Turkish, but it is very popular in Greece as well, as in other areas of the Mediterranean and the Balkans. 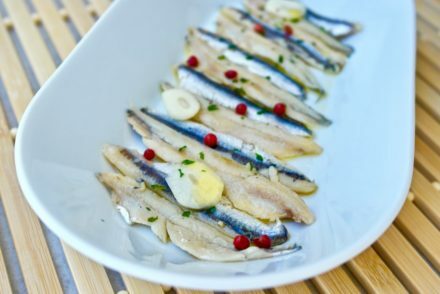 It is considered a lathero (a category of Greek dishes that are usually vegetarian and cooked in olive oil and tomato) and tastes better the next day. The original version calls for frying the eggplant. 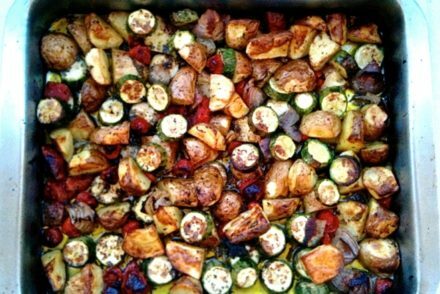 In this recipe I baked the eggplant, it does make it a little lighter on the stomach. This dish is better when you use narrow longish eggplants, but using the regular eggplant can work, but you may need to cut the eggplant in half instead of using it whole if it is too wide. Nutritionally, what can I say? We have the eggplant which is a great source of soluble fiber, the kind that lowers cholesterol and controls your blood sugar levels. Eggplant is also rich in heart protective antioxidants. Along with the onion, tomato and olive oil, once again we have a super-dish full of fiber, good fats and antioxidants and it’s vegan. Of course being Greek we eat it with feta, but even without it, it is delicious. There are several ways to make this dish, some recipes cook everything together, others cook it on the stovetop, I chose the roasting method and cooking the onions first. Preheat oven at Fahrenheit (200 degrees Celsius). Wash the eggplant. Remove most of the stem. Peel parts of the eggplant lengthwise all around so that you have a striped eggplant. Make deep slits on the peel parts lengthwise. Place eggplant in a pan, drizzle with a bit of olive oil and sprinkle with salt and pepper and roast for about 1 hour. In the meantime start on the onion mixture. Sauté the chopped onion in a pan with 1/3 cup olive oil until soft. 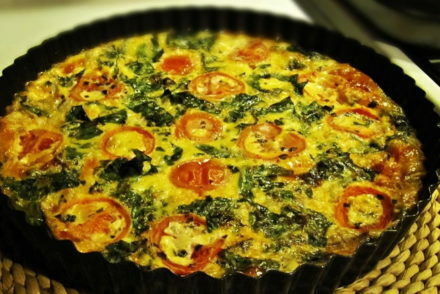 Add the chopped garlic, tomato, parsley and sugar and ½ cup water and simmer for about 15-20 minutes minutes. Add additional water if needed. When the mixture is ready it should not be watery. Once the eggplant is ready, open one of slits and stuff with the onion mixture. Do this with all the eggplant and place in the pan. Drizzle with olive oil. Add a bit of water at the base of the pan, roast for about 30 minutes. Remove from the oven. Serve warm or at room temperature with feta. It’s been my experience that in countries which don’t get a lot of sunlight, the vegetables and fruits are not nearly as tasty. 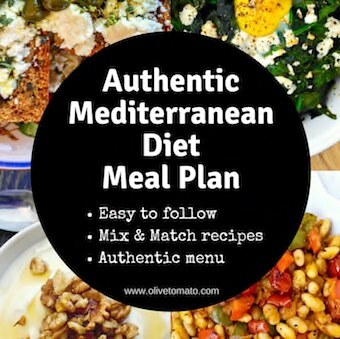 I have lived in Greece and Lebanon (I’m half Greek, half Lebanese) and the vegetables and fruits here are just much better tasting than those of other countries (not Mediterranean) i have been to. I was wondering your thoughts on the subject. Hi Cynthia, Yes, there are many factors including the soil and the water as well as the season. Great use of eggplant. I think maybe the flavor of the vegetables depends on how it is produced, and when it is picked. I have had eggplant and zucchini off of a garden plant, or straight from the farmer’s stand where it still had the smell of the plant on it. The taste of these was out of this world! I love the way you decreased the fat in this dish by baking it. I’ll be passing this along to my readers with gusto! Thanks Jason!and thank you for sharing. I always love reading your recipes because they remind me of my honeymoon when my husband and I traveled to Greece and fell IN LOVE with all of the traditional food! While we can find a fair amount of tasty Greek food in Chicago, your blog continues to teach about dishes I am less familiar with and inspires me to cook them in my own kitchen! Thanks for sharing! What a great dish! We devoured it tonight with crispy, roasted okra on the side. Cooking time was short after work so I microwaved the eggplant for 15 minutes and then roasted for 30. Worked out great. Important to cook the filling to a thick consistency. If tomatoes are juicy, add water sparingly. An incredibly rich and satisfying vefetarian dish results! Thank you Elana. I used a little grated carrot for sweetness instead of the sugar. Really great recipe! I have some light skinned aubergines which are average sized, not too fat like the black ones. If you cut them in half, do you do this at the roasting stage or after they come out of the oven? Thanks for all your recipes, I have made so many here in Greece and they always work! Best….. If they are smaller ones, than you do not need to cut them in half, just cut the slits. If you do cut them in half, this should be done before you roast them (in step 2). Thank you Fay! How wonderful to have grown up with your yiayiades! They are so wise.